The traditional style laundry room design incorporates plenty of storage, with an undercounter washer and dryer, but has the durability required of a mudroom! This design combines two very practical elements into one stylish space, including a laundry room and a mudroom. The traditional style laundry room design incorporates plenty of storage in classic white cabinetry, with an undercounter washer and dryer and a laundry sink. The white design is complemented by a grey mosaic backsplash design. 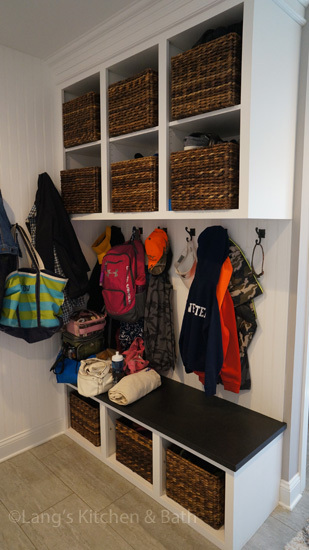 The mudroom includes a handy bootbench with space to hang coats and bags, and basket storage for shoes, hats, and more.